DETROIT, April 20, 2016 – Designing a car to win the 24 Hours of Le Mans in the year 2030 was the hot topic at today’s 13th annual Michelin Challenge Design and Automotive Press Association design panel held at the Detroit Athletic Club. 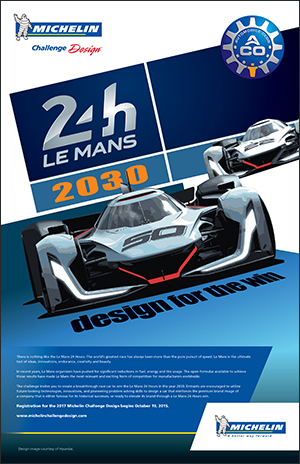 Based on the 2017 Michelin Challenge Design theme, “Le Mans 2030: Design For The Win,” is conducted in cooperation with the Automobile Club l’Ouest (ACO), organizers of the Le Mans 24 Hour race. The distinguished APA panel included Ben Bowlby, Motor Racing Designer and Innovator; Owner Ben Bowlby Racing LLC; Doug Fehan, program manager, Corvette Racing, an 8-time winning team at Le Mans, and Dave Marek, ACURA executive creative director, Honda R&D Americas, Inc. and a long time Michelin Challenge Design juror. “With Corvette’s philosophy, we’re planning 5-7 years out. We’re building it. We’re driving it. We’re racing it. There will be a metamorphosis sooner rather than later,” said Fehan. “From a designer’s point of view, Le Mans is the most interesting, open and relevant competition in the world today. Look at all of the great marques that have built credibility and image through their participation at Le Mans,” said Marek. “Tweaks in powertrains and emissions will happen. Interesting though will be the electric revolution that is gathering incredible momentum,” said Bowlby. “Electrical storage for racing powertrains is still all about the challenge of large volumes and the imperative to weigh less to achieve competitiveness against what is racing today on liquid fuel. There are different, but valuable elements to consider for the future: sustainability and integration with modern living, plus pleasure, durability and performance. Legislation at the government level will affect Motorsports more than ever,” said Bowlby. “Short term I expect more production cars coming forward,” said Fehan. The Michelin Challenge Design/Automotive Press Association forum is the first of several milestones in the Michelin Challenge Design initiative. Entries are due on August 1. A distinguished panel of automotive designers will judge the entries in late September. The winners from the competition will be honored at the North American International Auto Show in Detroit in January 2017. The grand prize winner will be recognized at the 2017 Le Mans 24 Hour race. Dedicated to the improvement of sustainable mobility, Michelin designs, manufactures and sells tires for every type of vehicle, including airplanes, automobiles, bicycles, earthmovers, farm equipment, heavy-duty trucks and motorcycles. The company also publishes travel guides, hotel and restaurant guides, maps and road atlases. Headquartered in Greenville, S.C., Michelin North America (www.michelinman.com) employs more than 22,650 and operates 19 major manufacturing plants.